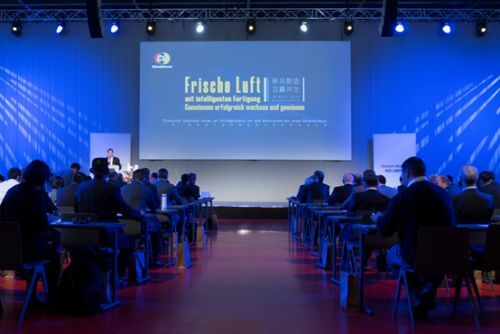 Niedernhall, Germany – (ACN Newswire) – The Third China-German Fresh Air Ventilation Technology Forum (hereinafter referred to as “China-German Ventilation Forum” or “Forum”), which was initiated by (FGK) and organized by Dream Maker, was recently held in Baden-Wurttemberg, Germany. In the context of the Belt and Road Initiative, the Forum, themed by Intelligent Ventilation for a Win-win Future, gathered authoritative experts in the field of ventilation from China and Germany and discussed in depth the technical standards of the ventilation industry in China and Germany and the future development of the industry. Dipl. Ing. Claus Handel, Chairman of FGK Europe, addressed the Forum and gave a keynote speech titled Civil Ventilation & Heat Pumps and Energy Conservation Technologies. He said that energy conservation and environmental protection had become a pillar industry of Germany, making important contributions to Germany’s economic development and improvement in living standards. At present, ventilation system has become a standard configuration of energy-saving, green buildings in Germany; as the renovation of old houses for energy conservation and the implementation of financial and tax incentive mechanisms continue, ventilation system should become a standard configuration of all buildings in Germany. Dipl. Ing. Bernd Klein, Director of IGE/HKL Inspection Department, said in his report that ventilation, heat pumps and energy-saving buildings were inseparable, as ventilation system was an effective means adopted by modern buildings to improve indoor air quality, while heat pumps were an effective means to save energy during heating. After presenting a comparative study between ventilation system and natural ventilation, Dr. Sun Hejiang, Associate Professor at the School of Environmental Science and Engineering, Tianjin University, pointed out that ventilation system could reduce indoor air pollution concentration and improve indoor air quality. When the outdoor PM2.5 indicator is higher than 75ug/m3, one should avoid opening windows for ventilation, but close the doors and windows and turn on the ventilation system. During sleep at nighttime, it’s best to keep the ventilation system working the whole night. At the Forum, experts from China and Germany, with a focus on technologies and standards, discussed the future development of the ventilation industry in China and Germany. Technologies and standards can regulate the industry, while enterprises and products are the direct drivers for the development of the industry. After the main agenda of the Forum ended, experts and guests attended the opening ceremony of Dream Maker’s new factory in Baden-Wurttemberg, Germany, and visited the factory. According to the introduction by Erwin Grohmann, CTO of Dream Maker, the factory has adopted an internationally advanced automated assembly line and mechanical arms, and after it is completed and put into operation, it will help Dream Maker double its capacity and further improve its product quality. Besides China and Germany, the products manufactured by the factory will also be sold in a number of countries in Europe.